DRP houses sophisticated facilities for optical and electron microscopy of cement-based construction materials. Image is everything. This is an EDS phase map is from a foundation subjected to sulfate attack. 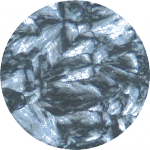 The petrographic microscope is a powerful tool for documenting deterioration mechanisms related to durability, such as alkali-silica reaction. 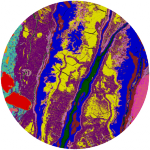 The most important aspect of petrography is understanding how it relates to performance. Our experience and expertise allows for a seamless integration of macro and microscopic observations. To the source!! We also work the pits and mines that provide the components used to produce concrete. We know we are part of a team that needs to solve complex problems quickly, reliably, and efficiently. DRP routinely works with engineering firms, general contractors, materials suppliers, concrete and specialty contractors, facility owners and professionals in legal and insurance services. Our expertise in materials allows our clients to focus on what they do best. Petrography. Air Void Analyses. Scanning Electron Microscopy. Learn more about how we can help you understand your concrete, mortar, aggregates and other materials. Years of training, education and experience differentiate DRP from the rest. Learn more here.